Immortal Florals take inspiration from Edwardian bridal crowns and the Victorian passion for preservation, to create delicate everlasting floral accessories. Ruth Boyd, the designer behind Immortal Florals, creates beautiful and timeless fine dried flower creations that will last a lifetime. Last year, Ruth was one of Art Macabre's Morte Couture models on the catwalk. This year, she is the other side of the catwalk as they showcase her new collection. NS: How did you get to where you are today? What was your route to becoming a florist and floral designer? RB: I became a florist ten years ago this year, when my sister married and wanted to save a few pounds on her wedding flowers by employing me as her florist. She sent me on a one day course at the fabulous McQueens, which really ignited a passion inside me for all things floral. From there I enrolled on further courses and started working at an amazing florist in Kensington, making floral displays for everyone from the Vietnamese Ambassador to the Queen. Not long after that I opened my own flower shop in Islington. NS: What are your inspirations as a designer? RB: I'm fortunate to live in London, where you're surrounded by inspiration on a daily basis. I try to go to a lot of exhibitions, visiting all the smaller galleries in Soho and Brick Lane more often than I go to the big shows. It might be just one image in a hundred that stays with you or triggers an idea, but that's all it takes. I have a huge fascination with history - particularly the macabre! It never fails to enthral me learning about different cultures' & eras' attitudes to death and the afterlife. Preservation goes hand in hand with this - taxidermy and other ways to preserve life have always been a great source of inspiration for me. NS: Any favourite designers/artists that you admire and who inspire your work? RB: I recently went to the Jean Paul Gaultier exhibition at the Barbican, and it really blew me away! The way he uses familiar styles and techniques from different parts of the world and various periods in time to create timeless, incredible garments really fired me up to get busy. His work is so feminine, whilst also powerful. It showed me that you can be really outlandish in your design, but a link to a historically familiar style will make you work more accessible/wearable. RB: I've worked with fresh flowers for many years, and whilst they are wonderful they have huge draw-backs. In recent years floral accessories (hairpieces, garlands etc) have had a revival, but the choices are limited. Who wants to wear plasticcy fake flowers to their wedding? But fresh flowers weigh a ton and often wilt before you and your party do. Dried flowers are a natural, ethical, beautiful solution. And after the wedding they make a gorgeous keepsake of the day. Imagine your floral head piece displayed in a vintage bell-jar. What could be a more real, physical memory of the day. NS: Who do you imagine wearing your designs? RB: Bold thinkers and dressers, with a discernment for quality! Children are very fortunate; they have an untarnished passion for sartorial adventure. I champion a similar devil-may-care attitude in adults. If it looks good then wear it and proudly own your own style. 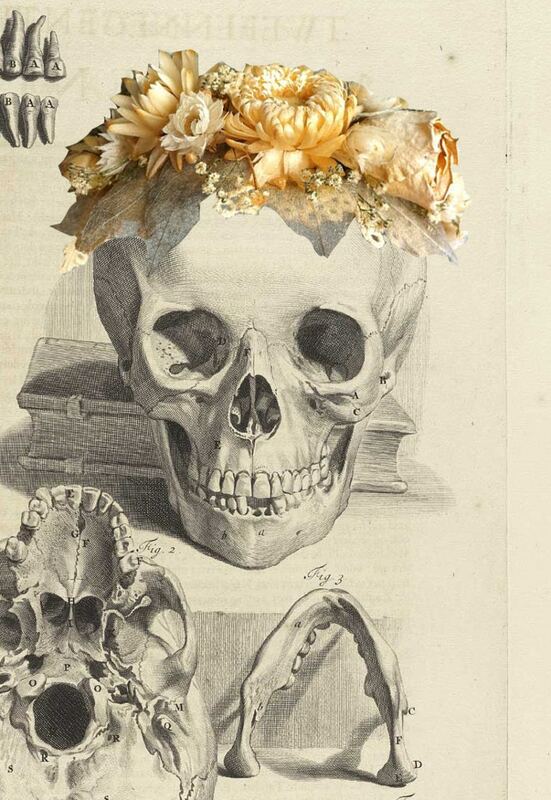 NS: Who'd be your dream model to create an Immortal Florals creation for? RB: Imagine Lady Gaga asking you to make her something to wear... you'd have an entirely free reign to let your creativity run riot. I don't think it would have done me any harm to get a commission for Kate Middleton's wedding attire! But my favourite is Paloma Faith. I adore her style and if I could work with her stylist to create something then I'm sure it would be enormous fun, as well as a huge honour. NS: Where do you create your designs? Do you listen to music/have any routines to work to? RB: I work at home, in Hackney. By the end of the day every lamp, every curtain pole, every chair-back ends up draped in drying flower creations. The only drawback with working from home is that I find it hard to stop - I can often work long into the night because I love what I do. I think the music I listen to influences my work - If I listen to Classic FM then my creations are more traditional. Some days I'll listen to Brian Jonestown Massacre and create loose, carefree designs. Gogol Bordello can guarantee something colourful and bold! NS: What materials and equipment do you use to create your designs? RB: Every design is different, and I love experimenting with new techniques and materials. I have to ensure my work is high quality, so to create the basis for my designs I use wire and carefully stitch lace and ribbons onto the base to give a good strong structure. I use dried flowers, seeds, herbs and leaves, but I'm always picking new flora and experimenting with drying techniques for unique materials. NS: What do you think are key design trends for Spring Summer 2015? What's new and planned for Immortal Floral collections in Spring Summer 2015? RB: I've never really followed trends, but I’m aware that floral head garlands have been gaining popularity since Kate Moss dressed all her bridesmaids in them for her wedding in 2011, so I think this is a trend which will continue to grow. 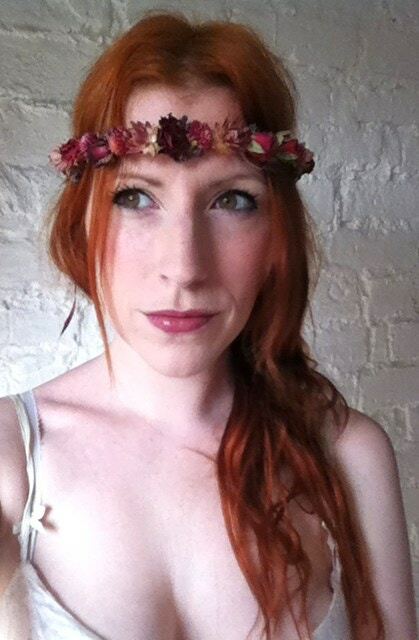 Immortal Florals intend to progress this from festival style, to something altogether more wearable and more refined. We can’t wait to see Immortal Florals designs in full bloom on our catwalk next week! You can attend Art Macabre's Morte Courture workshops at Cass Art this London Fashion Week - click here to book your place. Visit Ruth Boyd's Etsy page here.